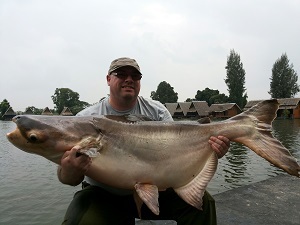 Fishing in Thailand at Bungsamran Lake in Bangkok for the enormous Mekong Catfish is an experience that all serious anglers and sport fishing fans should include when visiting Bangkok on a Thailand fishing holiday. The Mekong Catfish is yet another giant freshwater fish which is indigenous to Thailand and is another strong contender for the title of the world’s largest freshwater fish. The Mekong catfish in its wild and natural habit of the Mekong River in Northern Thailand has become extremely rare due to over fishing and dam construction and has been previously caught in local fishermen’s nets to an incredible 293kg’s. The Mekong Catfish in Thailand is one of the hardest fighting freshwater fish in the world and has attracted anglers and sport fishermen from all corners of the world wishing to do battle with these monstrous freshwater leviathans. The world famous Bungsamran Lake in Bangkok holds what is possibly the largest Catfish in the world with numerous monster sized Mekong Catfish and other monster fish swimming in its dark and murky depths to an estimated one hundred and fifty kg’s. Anglers visiting Thailand on a fishing holiday should strongly consider a daily fishing trip to Bungsamran Lake in Bangkok to fish for the legendary Mekong Catfish. Anglers fishing for this species in Thailand will experience the exhilarating thrill of long protracted battles with this muscular giant catfish species and witness first hand the explosive and awe inspiring power of what is one of the hardest fighting and largest of freshwater fish in the world. The world famous Bungsamran Fishing Park Lake is situated on the outskirts of Bangkok in the bustling urban district of Ban Kappi. Bungsamran Lake in Bangkok is located down a quiet unassuming Soi (street) which winds through a series of back streets before arriving at the lake. On arrival at Bungsamran Lake in Bangkok visiting anglers will be greeted by a mature twenty acre commercial fishery that has produced numerous Catfish world records and is quite possibly the most heavily stocked lake in the world! Bungsamran Lake in Bangkok is a large rectangular lake with variable depths to 25ft which is dissected by a stilted wooden platform through its central section allowing fishing on both sides of the lake. Whilst angling for the big cats at Bungsamran Lake in Bangkok anglers will fish from the central stilted section of the lake with sliding float set ups used in conjunction with inline feeders. When fishing at Bungsamran Lake for this species anglers will mould large balls of specially mixed groundbait to the feeders before embedding a large size 2- 4 hook into the side of the ball of bait and casting out into the lake. Angling at Bungsamran Lake in Bangkok with our expert team of Thai fishing guides could be described as being highly prolific with large hauls of monster fish enjoyed by our clients on a regular basis. Fishing Mekong Catfish Bungsamran Lake Thailand Battles with this muscular giant catfish species are generally long drawn out and protracted affairs lasting several minutes if not hours which test the angler’s skill and determination to the absolute limits. Anglers visiting Bungsamran Lake and fishing for Mekong Catfish can expect hectic sport and an action packed days angling. Anglers fishing at Bungsamran Lake regularly enjoy large hauls of monster fish catching up to thirty fish in a single days angling. 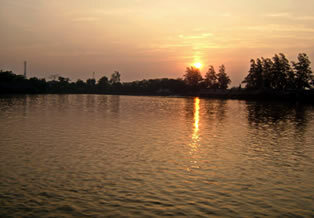 Angling at Bungsamran Lake in Bangkok is ideally suited for anglers of all skill levels and experience. Bungsamran Lake is situated in a convenient central location close to the heart of Bangkok making it an ideal venue for the visiting angler to fish on a daily or weekly fishing tour. 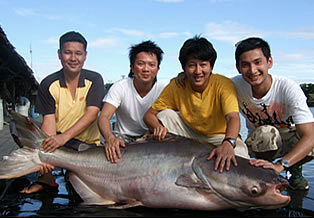 The daily itinerary for our Thailand fishing trips at Bungsamran Lake is listed below. Fishing Thailand Mekong Catfish Specialist angler(s) fishing at Bungsamran Lake in Bangkok in search of Mekong Catfish will be collected from their Bangkok hotel by a Fishsiam representative at 8am who will accompany you in an air-conditioned minibus to the world famous Bungsamlan Lake. On arrival at the lake the angler(s) will be equipped with all necessary fishing equipment ( 1 rod and reel outfit) and relevant terminal tackle. In addition the angler will be supplied with all bait (bread mix) and additives for the entire days angling. Angling from the public area known as the shed under the guidance of one of our Thai pro-guides you will experience non-stop adrenaline pumping action from hard-fighting monster fish throughout the day catching numerous catfish upto weights of 100 kilograms. Bungsamran Lake in Bangkok Thailand The Fishsiam guide will assist in all netting, photography and other angling requirements throughout the entire days fishing. Please note that due to recent price increases our packages now only allow fishing with 1 rod. It is possible for 1-3 anglers to share this package. Additional rod hire is now priced at a further 2,500 baht per day. The duration of our daily Mekong catfish fishing trips to Bungsamran Lake is eight hours after which the angler(s) will be transported back to your Bangkok hotel in an air-conditioned minibus. 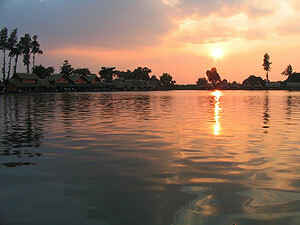 Fishsiam offers daily trips to Bungsamran Lake in addition to weekly packages with various accommodation options. Bungsamran Lake can also be combined in our tailor made fishing holidays which are designed to meet the specific requirements of the visiting specialist angler.